Is inflation likely to soar? 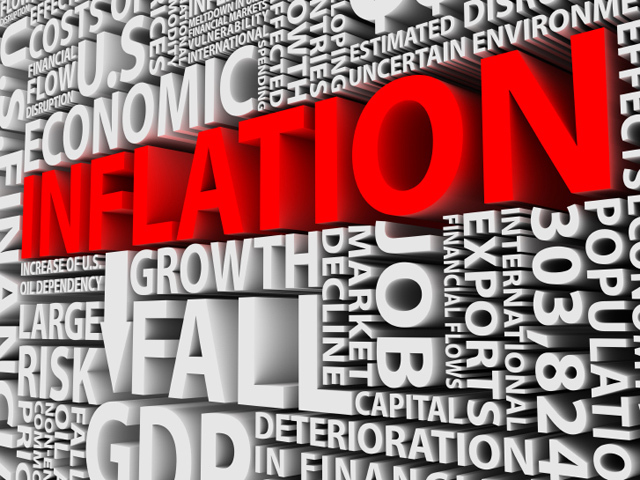 (MoneyWatch) One of the greatest fears investors face today is the risk of runaway inflation. They fear that a combination of the Federal Reserve's actions of both quantitative easing (increasing the size of the Fed's balance sheet from about $1 trillion in 2008 to about $3 trillion today) and qualitative easing (lowering the Fed funds rate to zero) will lead to a recurrence of the type of inflation we faced in the mid-1970s and early '80s. And the fear seems to be paranoia, fueled perhaps by the run-up in gold prices. Since my crystal ball is always cloudy, I'm not in the forecasting business. And I certainly admit that inflation could, at least in theory, soar. But a look at the evidence suggests that the risks are overstated. The reason: We're not seeing the same factors that stoked the fires of inflation in the '70s and early '80s. First, Americans' disposable income at the time was growing by double digits, as was nominal GDP, the velocity of money, housing prices, and, most important, bank credit. Today, all those figures are either in the low single digits or are negative. Second, with unemployment still above 8 percent (not counting discouraged workers who have temporarily left the workforce), it seems hard to imagine inflation pressures coming from wage increases. And wages and home prices (or equivalent rental costs) are much larger components of the Consumer Price Index than are commodity prices (which, as with the price of oil, have been rising and attracting all the attention). All of this explains why although the Fed has been injecting a tremendous amount of liquidity into the economy, the increase hasn't translated into an increase in inflation. The increased liquidity hasn't found its way into the system, as people aren't spending and banks aren't lending. Third, if the market was concerned about the risk of runaway inflation, we would expect that risk to show up in bond yields. Yet there's no evidence of that. If investors thought inflation was getting ready to spike, 30-year Treasury bonds wouldn't be yielding only 3.3 percent, no matter how many bonds the Fed was buying. Fourth, economic forecasters' average estimate for inflation over the next 10 years is just 2.3 percent. With 10-year Treasuries yielding about 2.2 percent and 10-year TIPS yielding about -0.1 percent, we have a break-even inflation rate exactly matching the 2.3 percent forecast. If investors feared the risk of unexpected inflation, we would see evidence of that in a much higher nominal rate, creating a risk premium for unexpected inflation. My point isn't to dismiss the risks, but to put them in some perspective. Certainly, there's the risk that if and when the economy picks up, consumers will once again open their pocketbooks and banks will begin lending again. If that happens, it will be incumbent upon the Fed to reverse course, take away the proverbial "punch bowl," unwind its balance sheet, drain the financial system of excess liquidity, and raise interest rates. If it fails to do so, inflation will take off. However, the Fed is well aware of the risks. And the markets remind it of them of every day. The central bank faces a tough decision, running the risk of tightening too quickly (the mistake made during the Great Depression) or not tightening fast enough. Unfortunately, this is art, not science. The bottom line is that investors should already have built into their plans the risk of unexpected inflation. Those who are more exposed to that risk should avoid longer-term nominal bonds and have a strong preference for TIPS in their portfolio. They should also consider including an allocation to commodities in their portfolio. Having a fixed-rate mortgage (as opposed to a variable-rate mortgage) would also be advisable.